Texas Custom Irons: Check it out! Having been a tattooist in a shop since late 1989, my machine building days started back around 1997. I have had the privilege of working with, and meeting many great artists over the years. This along with several years as a jeweler has aided me greatly in producing the machines I make today. From start to finish I personally hand make every machine I sell. Always keeping ethics and quality as my main objective. Cutting, grinding, sanding, filing, machining, and welding is completely done by myself. Due to that fact there is short waiting period. I take a more dated approach to creating my machines in the traditional sense, that involves using hand tools rather than state of the art equipment. 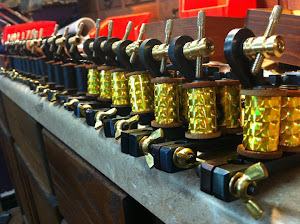 Thus, making each machine a true handmade one of a kind original. handmade machines. I hand cut all the springs, and hand turn all binding posts as well as contact screws. All machines are tuned and broken in prior to shipping. As mentioned I hand fabricate my own frames as well as work from classic styles to customer blueprints. Many of my classic machines are based on the works of Paul Rogers, Percy Waters, Owen Jensen, Johnny Walker, and “Cap” Coleman, as well as many others. Exclusively sold to professionals only. I personally like to speak with the artist I am building for to ensure I set the machine up to their preference, as well as answer any questions they may have prior to ordering. When I am not building machines I can be found at my tattoo shop, Fine Line Tattoos. 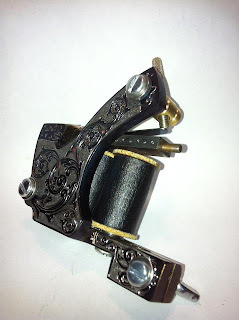 Copyright © 2000-2012 "Texas Custom Irons". All rights reserved. Picture Window theme. Powered by Blogger.